We are proud to offer the most extensive list of sailing yachts, multihulls and motorsailers in Greece and one of the largest in Europe with over 100,000 boat photos on reserve. GREG-YACHTS is an international yacht broker agency based in Greece, in the vicinity of Athens and very near to the busy Corinth Canal, the main transit gate of yachting and shipping between the Aegean and the Ionian. Yacht sales in Greece and in nearby regions such as Turkey and Cyprus has been our aim. Greece with a coastline of approximately 15,000 km, the large number of islands approximately 250 inhabited and another about 2,250 small uninhabited islands and islets, provides a unique area in the Mediterranean and in the World for yachting fans. This as a result has attracted a large number of local people as well as foreign nationals to have a yacht and sail the Greek Seas. Our listings cater to offer the interested yacht buyer a very large selection to choose from. Through our pages you will find private boats, charter yachts, blue water yachts, motorsailers, motor yachts, catamarans and trimarans for sale as well as a few traditional wooden boats. Multihulls are increasing in popularity as the newer models represent good options for chartering as well. You will also be able to find a small selection of motor catamarans and wooden yachts for sale. Our area of boats for sale covers all locations, from large Marinas in Greece and boatyards and up to the most isolated harbors and small yards. Our listings begin with a very large number of yachts in Athens and nearby area, including yachts in Lavrion and the nearby islands. 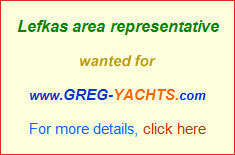 We also offer the largest number of yachts for sale in the Ionian and especially in Lefkas, Corfu and Preveza. Lefkas and the greater area has attracted many private boat owners. Many of them bought an ex. charter boat and brought it there and some of them brought their own private yacht in the area too. Nidri in Lefkas spelled also as Nydri, opposite from the Island of Scorpios belonging to the family of the famous Greek Tycoon Aristotle Onassis, has become an important yachting area in Lefkas together with adjacent Vlycho with the famous Vlycho Bay, a very tranquil area for mooring. Boatyards in Nidri and Vlycho still use the old traditional method of hauling out and storing vessels. Yachts in Nidri and in Vlycho spelled also as Vlicho maybe found in the water also in winter due to the protected waters. No surprise the area in front of Nidri has been called Tranquil Bay. Nidri and Vlicho host a significant number of smaller yachts not to be found in so big numbers in other yachting areas in Greece. Preveza Marina and nearby Preveza Boatyard and Aktion, lying opposite to each other, have attracted a large number of privately owned boats. A large variety of ocean going, liveaboard and bluewater cruising vessels is encountered in the area. Boatyards at Aktion are chosen by many yachtowners to leave their yacht there for winterizing. 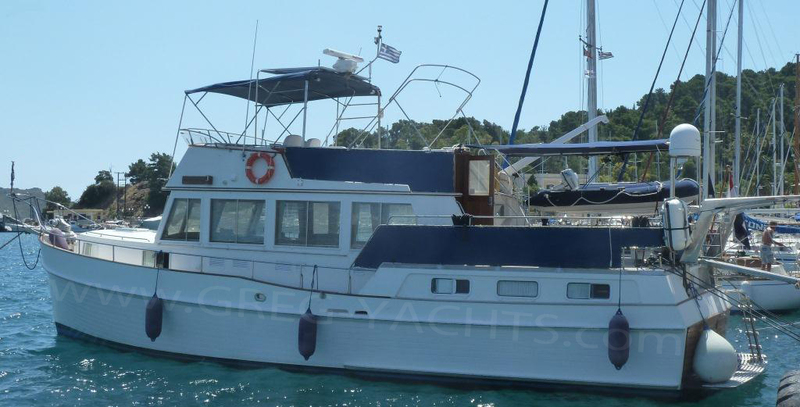 Corfu in the north will provide a balanced variety of private and charter boats for sale. On the Greek Mainland up in the north our yacht sales extend to Thessaloniki, Chalkidiki, Volos and in the south to Kalamata, Patras, Porto Heli, Koilada and other smaller yachting sites in the Peloponnese. Mesolonghi Marina in the West also spelled as Mesologgi Marina, has become an emerging yachting site lately where we offer a number of privately used boats. In the Aegean, our large range of boats on sale in Kos, Leros, Rhodes, Samos, Santorini, Crete and other smaller Islands in the Aegean. Santorini Island with its famous caldera and the volcano and the world famous spectacular sunset from Oia, has become the number one destination for catamaran sailing in summer time in Greece. In addition to the all the above, we offer a significant number of yachts for sale in Cyprus. Yacht sales in Turkey represent a significant share of our boat listings scattered also in various Turkish Marinas. 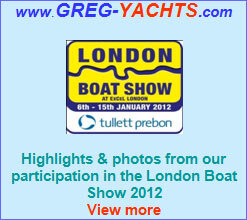 Visit our section of bargain yachts for sale, for very good offers. Now due to the economic crisis, you will find a significant number of yachts for sale in Greece of all types at very attractive to even real bargain prices. Furthermore as the charter season is coming to an end for this year, it is the most optimal period now to look and buy a yacht at the lowest price before the maintenance for the next season begins and before charter yachts start to receive bookings for next season. This is similarly applicable for private yachts, as their owners have disposed them on land for the winter and would be more eager to sell now. Whether you are looking for a yacht to liveaboard, aft or centre cockpit, sloop or ketch, fin, bilge, lifting, swing or long keel, deck salon, pilothouse or flushdeck, steel, aluminium, ferrocement or just GRP yacht, we are quite confident that you will find interesting options at our greg yachts for sale in Greece. Whichever area you decide to view one or more of the yachts we have for sale, we can assist you in your travelling plans, accommodation in the area and offer you the best service possible.